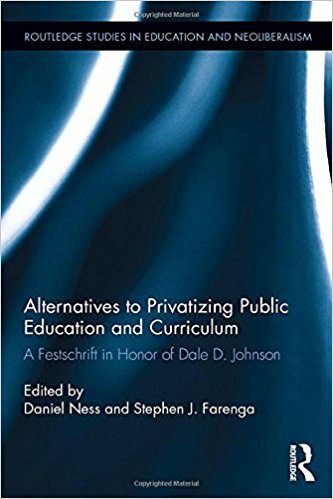 Through conversations in honor of Dale D. Johnson, this book takes a critical view of the monoculture in curriculum and policy that has developed in education with the increase of federal funding and privatization of services for public education, and examines the shift from public interest and control to private and corporate shareholder hegemony. Most states’ educational responsibilities―assessment of constituents, curriculum development, and instructional protocols―are increasingly being outsourced to private enterprises in an effort to reduce state budgets. These enterprises have been given wide access to state resources such as public data from state-sanctioned testing results, field-testing rights to public schools, and financial assistance. Chapter authors challenge this paradigm as well as the model that has set growing premiums on accountability and performance measures. Connecting common impact between the standards movement and the privatization of education, this book lays bare the repercussions of high-stakes accountability coupled with increasing privatization.